Prepare brownies following the directions on the box. Grease an 8x8 pan and line with parchment paper; pour in the batter. 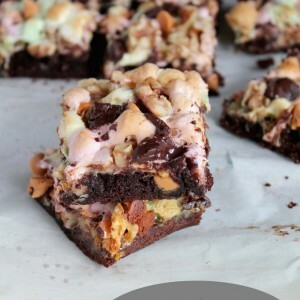 Take out the brownies and layer with half of the butterscotch chips. Add the marshmallows, walnuts, the rest of the butterscotch chips, and the dark chocolate chips. Put the pan back in the oven for 10 to 12 minutes, or until the marshmallows have started to melt. Take the pan out of the oven and completely cool before cutting.